View Larger Image Checking our progress. The Roaring Lion River was too high to walk alongside so we bush bashed on the terraces above the river on its northern side. 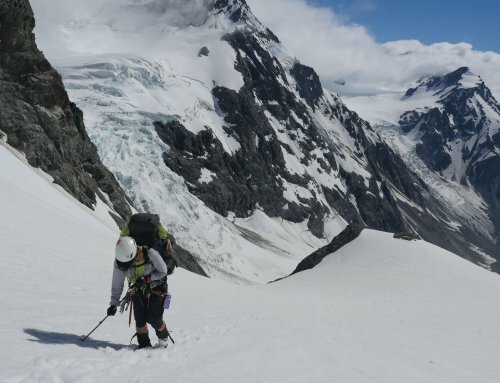 Photos by Ian Harrison and words by Emily Shrosbree from the Wellington Tramping and Mountaineering Club. The idea was for a wilderness journey from one watershed to another, following the Roaring Lion river all the way to its headwaters and climbing up and out to Lake Aorere. From there the plan was to drop down into the Spey River for a short while, then up Takahe Stream and along the Gouland Range to join up with the Heaphy Track at Perry Saddle after twelve days of adventure. We calculated we’d need to cover around 8km per day, and allowed for a couple of rest days in our food allocations. We’d gathered a few reports from various trips spanning decades which gave us a bit of a feel for the terrain and part of our route, although none which had covered exactly the same route as we were intending. Some of these reports made great reading, with many of the trips focussed around searching for signs of kakapo in the area after the discovery of booming sites (later concluded to be caused by lightning strikes rather than the loveable goofy bird). Time at home after the Kaikoura earthquake helped with our dehy-prep productivity and planning sessions. I had fun weighing out all my gear, spread-sheeting it to oblivion and then seeing how many grams I could squeeze out by substituting items and shaving anything unnecessary out – as a team we swapped tips about how to keep the weight down, trading weights of communal items to ensure we were only carrying the lightest option. This was to be my first long trip, and first to a wilderness area. When Debbie first approached me to ask whether I would be interested in being one of the team I immediately committed – this was an unmissable opportunity to tramp somewhere I might never even have thought of, with a team of awesome people. We were honoured to receive some funding from the Simon Bell Memorial Scholarship to make the trip possible with a helicopter ride into Roaring Lion hut which would be the start of our journey. Megan, Ian and I flew from Wellington to Nelson. Obligatory pack-weighing – all coming in around 20-25kg. We carried pretty much no water as we figured we’d be spending the first few days next to the river – handy when packs were already very heavy. Walking poles were essential for the extra balance. We convened at Nelson airport. Somehow we crammed four packs into Debbie’s car, and made a beeline for the nearest bakery for our last taste of non-dehy calories before heading for the helicopter. The weather was beautiful; clear, calm and warm. We loaded up the packs and were briefed about how we needed to exit the helicopter when we touched down at Roaring Lion hut. About 20 mins later there we were, transported to the edge of the Tasman Wilderness Area. We’d left Wellington around 8am, and it was still before 11! Bit difficult for the brain to compute. As our helicopter flew off I think we all felt a strange mixture of abandonment and excitement about the journey and adventure ahead of us. All the months of preparation and here we were – I already had my first sandfly bite of the trip to prove it! Nothing more stopping us from beginning our anticipated 12 day journey up the Roaring Lion River. We signed the hut book, hauled on our very heavy packs and made our way down to the river to cross for the first time. Roaring Lion Hut is neatly placed on a small terrace just above the Roaring Lion River where it joins with the Beautiful River and just before they join the Karamea River. Our research suggested the best way up the river was on the true right to start with. At the hut the river was reasonably slow flowing as a waist deep pool so we were treated to a cold deep crossing right from the off. The pool was deceptively clear so we had to be careful to keep to the waist deep parts rather than dip any further. Once across we were in the wilderness proper and immediately bush-bashing to find the easiest way up to around 300m, then along. That was the last we saw of the Roaring Lion itself for Day 1. We stayed around the 300m mark, working our way along roughly parallel but above the river. Some of the travel was easy, just picking our way through relatively light bush, in other parts it was denser, and there were some steep gradient changes at points which took a bit of negotiation. Checking our progress as we bush bashed on the terraces above the Roaring Lion. We’d been on the move since around 11am and not seen anywhere suitable to camp so by 5pm we were starting to get a little concerned that flat spots didn’t exist in these parts. We arrived at a reasonably hefty side stream. Looking down to it, it was quite steep sided and looking at how we could get out the other side just looked impossible to me. But here we were, a seeming blockage in our path up the Roaring Lion, only on Day 1, a challenge laid in front of us. We stood for what seemed like ages discussing how to climb down, and if we could get down where to best cross, and if we could cross, then where to climb out the other side. It all looked impossible, but it was at the same time a problem that needed solving. No camp sites behind us, so our resting place for the night would be somewhere beyond this side-steam and so we needed to work out a way to cross it safely. South Island Robin/toutouwai following our progress. Between us, bit by bit we did it…and once over the other side we could continue on to find the next challenge! This was going to become addictive. Sometime after 6pm we stopped for a snack break pondering that the flat spot in front of us was the best camping spot we’d seen all day….just a shame there wasn’t any means of getting water nearby with the previous side stream now being some way back. Oh well, we would have to continue and hope somewhere suitable revealed itself before dark. Within 100m we were squelching our feet – yay! – water – we can camp here after all! So it was that Day 1 saw us setting up camp around 7pm, having travelled our stipulated 8km (ish), ready for our first night in our tents in the Tasman Wilderness Area. The only flat camping spot we’d seen all day.. This is one of the aspects of this trip that I enjoyed most…simply not knowing what we would come across and how we would overcome things. This wasn’t a trip that could be looked up on the DOC website, or even in the vast reams of WTMC trip reports – it was a trip where we just did not know what to expect and it felt ever-so-more exciting and challenging for that. The problem-solving involved was rewarding and we worked well as a team. There were many initially impossible-looking obstacles that we tackled together, some by trial-and-error (this way’s not going to work, this way looks doable), some by sheer luck, some by just pushing on through! The morning’s first challenge was to find the best way down to the river as we expected the best travel for most of the day to be at river level. This involved negotiating our way down a few terraces but was all fairly straightforward. We came across a few monitoring stations as we progressed – it was surprising how much evidence of people there was in the wilderness, although we didn’t see anybody until we were in the Cobb Valley on our way out. Once by the river we had fun traversing rock slabs, sometimes walking up on them and sometimes using them as holds as we waded along up to chest deep in the relatively slow flowing river at this point. It was here we came across a pair of whio – the first I’ve ever seen which was awesome! We carried on up the river, with sections of fast progress along the river bed, sections in the scrub at the side of the river which were a bit slower, and the odd crossing which took a bit of time to find good crossing points and where we mostly chose to link up. It was on one of the faster sections of rocky river bed where my heel dropped lower than my calf was prepared for – ouch! With my basic first aid knowledge of ‘Rest Ice Compression Elevation’, I immediately immersed my leg in the river (the nearest option to ‘ice’), and we started digging through my pack for some tape to attempt some ‘compression’. Rest and elevation were not really an option but I figured two out of four was better than nothing. Ian remembered using a wedge under his heel for a previous calf injury so we put a small section of my precious ¾ snowfoam mattress in my boot (turns out saving weight not carrying an Exped mattress can be a blessing!). We also re-distributed some weight. That made walking possible, although I had to concentrate harder to avoid another over-stretch. We had to make several crossings as we worked our way up the river, and each one was taking us a fair amount of time to find a good crossing spot. The river wasn’t in flood, but is was certainly running higher than the others recalled from their previous visit. It was hot and sunny, but cool in the river. We’d set off that morning with the ambitious aim of reaching Breakfast Creek, where the others had camped on their previous trip. With the slow bush and river travel, combined with my now dodgy calf, I was assuming we wouldn’t make it. We stopped at a possible camp spot where there was a small island in the river around 6pm and had a check-in chat about how we were feeling. We all agreed that given we still had energy and daylight it was worth pushing on for another hour or so to make it to Breakfast Creek. In that last section there was an awesome slot gorge on a side creek, the kind you imagine could get completely jammed up in a flood and then suddenly release a big rush of water into the main river. We were packed and ready by 8am I think, with the initial test being whether I could walk with my pulled calf muscle. The sponge wedge was making it feasible, if I took care with my foot placing, so walking took more brain effort and concentration than usual but was doable. For a short while we had some easy flat travel along and just beside the river bed. After half an hour or so, we came to some bluffs where the river narrowed so we assessed the crossing places. On the other side, the lovely flat terrace beside the river continued, so we were keen to get across to keep the easy travel going. Every spot we considered looked uninviting. The river at this point was deep in places and flowing fast. This was another of these impossible-looking-problems that the wilderness was presenting us with. Not favouring crossing, we tried a different tactic. We climbed up the terraces before the bluffs to attempt to get above them to a point where it was feasible to traverse or avoid them. At the second terrace we hit the bluff, so we retreated, back to the river to re-look for a good crossing points. It didn’t look any more inviting than before, so back we went up the terraces to try a different angle to get through the bluffs. Ian made it a fair way across and it was looking promising but then the call came that it wasn’t traversable any further so we were back to the river option. With the fuller-than-normal river and pulled calf on our minds, we knew that once we crossed the river we’d be on the wrong side for any of the escape routes, and more committed to the full journey up the river with every step. But we paced along the river some more, still searching for the point where the waters would part and show us the ideal crossing spot. We each ventured in a little way in various spots, only to retreat each time as it was flowing too fast or looking too deep for comfort. At this point along the river the sandflies were of the super-vicious variety. Usually, when you are moving you are safe, but these monsters were biting regardless making each failed re-visit of river or terrace option more demoralising. A group chat was called and we made the decision to return to our campsite at the foot of Breakfast Creek and declare the remainder of Day 3 a ‘rest day’ while we considered our options. And so, within less than three hours of breaking camp, we were re-making camp. The rest of the day was spent pouring over maps, snoozing and watching the river for any signs of a level drop. Ian also spent a good while rigging the mountain radio aerial in text-book style. The nightly mountain radio sched confirmed that rain was coming tomorrow. If anything the river was going to go up, and so reluctantly we reconciled ourselves to the fact that we would be exiting the Roaring Lion via Breakfast Creek on Day 4. For the three others, this would be the second time that this exit route had been used. (Just to prove we weren’t imagining it, we did some post-trip analysis of river level data for the Karamea River which illustrated the higher levels in the summer of 2017). Today was wet. Wet from the creek, wet from the moss, the ferns and wet from the sky. But, regardless, the journey up Breakfast Creek was wonderful. I’ve never seen so many shades of eye-popping green – it was a magical journey with lots of interesting obstacles to climb up and around as we made our way up. The creek goes underground at the top as we approached Lake Henderson, which is a bit disconcerting, but we popped out at the lake by mid-afternoon nevertheless and started scoping out camp sites. At the outlet end there was enough flat space, but we figured it’d be fairly exposed if the wind got up so we might as well use the rest of the afternoon to travel around to the other side to camp in the trees. For some perverse reason we opted for a bush bash on the southern side of the lake, rather than the simple stroll around the northern banks of the lake. This bash was probably the single most underestimated part of the trip. There were thick branches over the steep rock slabs which were mostly too steep to walk along. The lake was also higher than usual so we were sometimes shoulder deep working our way round the rock slabs, or when we were out of the water we were variously squeezing ourselves between branches or trying to unpick our pack straps to avoid being pinged across the lake catapult-style. The 90 minutes or so it eventually look us to sidle round half of the lake was hilarious and exhausting at the same time. We were rewarded with a lovely camp spot in the trees, and an even more perfect swimming spot for our final night of the trip. Again, Ian rigged the radio up and we were able to organise our lift – the mountain radio service is excellent! From Lake Henderson we climbed up and over the Peel Range into the Cobb Valley. We stopped for lunch at Tent Camp, having noticed the signs of civilisation slowly appearing as we picked up the marked trapping track down an hour or so earlier. From there it was a couple of hours of marching which turned out to be much harder on my calf than the rough country we’d been making our way through previously. The repetitive marching along the track was making me realise perhaps things were all working out for the best and our early exit from the Roaring Lion was meant to be for this time. Ian’s dad met us as the road end with hot tea and fresh oranges. We then piled into the car, apologising for the smell and headed for the showers and a nice meal. Our collective mood was muted, as we’d been expecting to be tramping for a further seven days, so being back in the real world after just five took some adjusting to. Looking back however, this was an incredible five day trip in itself….just a shame we were weighed down with twelve days of food! On our way back to Nelson airport we arranged to call in to visit Simon Bell’s parents. We shared the details of our trip and presented them with a print of one of Ian’s stunning shots from the trip as a thank you for their help in enabling the adventure. I never met Simon, but had heard his name mentioned many-a-time involved in adventures with others from WTMC, TTC and beyond so it was lovely to hear more about him and his family, as his parents shared stories of their family tramping adventures. Once more, I felt humbled to have had the opportunity to share such an adventure with such great people. Nevertheless, I think we all feel there’s some unfinished business with Roaring Lion – we are all keen to make a return to the area and carry on exploring to the upper reaches of such a beautiful river.